This is a slightly cleaned up transcript of a short talk a presented as part of the month “Collections and Services” meeting for the University of North Carolina libraries. Collections and Services is the librarian-led, bottom-up meeting for information sharing across library departments. As the new Digital Scholarship Librarian, I was asked to give a brief overview of digital humanities and say a little about how they intersect with libraries. I don’t think there are any terribly new insights here and some bits are certainly over simplified. Therefore I was pleasantly surprised when several of my colleagues mentioned that they found the framing helpful. I’m sharing it here in case anyone else might find it useful or, more likely, if you need to give a similar talk and want something on which to build. 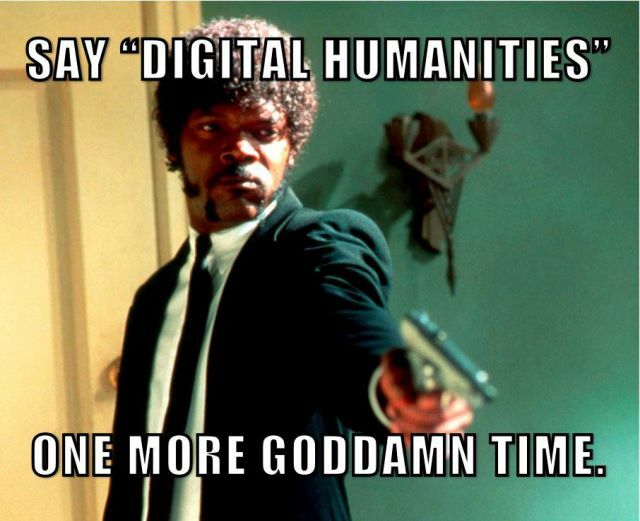 At the risk of loosing my job I’m just going to say that I don’t what Digital Humanities is/are anymore. I have seen this term applied to such a bewildering range of human activity – and non-human activity, for that matter – that I fear the term will lose the power to do much of anything besides make people argue. But, with apologies to Mr. Jackson, I feel like I need to provide you with, if not a working definition, then at least a framework for understanding what people might mean when they say digital humanities. 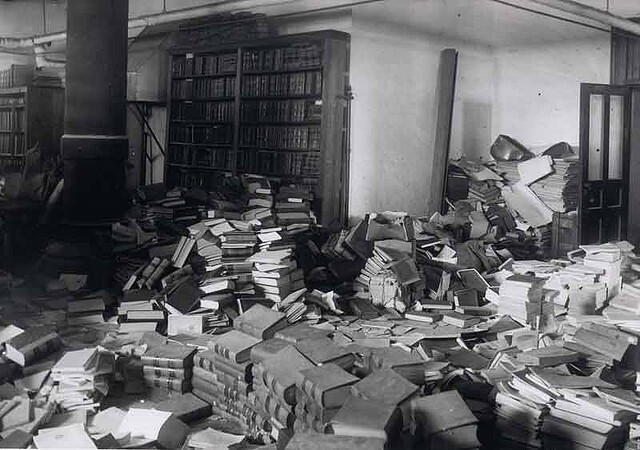 So, I feel like the idea of digital humanities is kind of a mess. I’m a librarian so when I see a big mess, I want to start organizing it. When we break down digital humanities into these categories, I think it’s easier to see all the different ways for libraries to get involved. I want to go through each of these categories and talk about some examples. This is basically about publishing but with all of the possibilities the web has opened up, I prefer the broader term that does not immediately call to mind just online versions of monographs and journal articles. The current ecosystem of scholarly communications contains each of those but also dynamic websites, curated archives and sophisticated visualizations. Libraries are particularly interested in this as we need to figure out how to organize, index and archive all of this. Furthermore, some libraries are exploring what it might be like to actually become the publisher for some of this work and create an alternative to the increasingly expensive and – some might say, exploitative – reality of corporate academic publishing. Once again, this feels like an evolution from the kinds of work we have always done in libraries. Instead of traditional term papers, students may need to build websites or online exhibits or they may have new media projects. Often libraries are called upon to take on some of the instruction duties and they may even be asked to host the student work. I hesitate to include this as a category of digital humanities because simply being on Twitter does not make one a digital humanist. However, for some disciplines, online social networks can be extremely valuable and this is especially true for digital humanities. Even if you don’t want to Tweet, following people who are active in the disciplines with whom you work is a good way to stay up to date on what different fields are talking about. Additionally, it can sometimes be useful to follow along with a conference through the tweets that are being generated. Keeping up with Twitter could even be a service you provide for faculty who are not on Twitter themselves but who may be interested in the kinds information sharing that happens there. This is going to sound dumb but this one actually confused me for a while. The conversations around Digital Humanities and Digital Libraries evolved in tandem for years but there was not too much cross-pollination except for some of the archive projects like Rossetti, Blake and Women Writers. When digital humanists and digital librarians began coming together at venues like THATCamp, I felt like it took while to figure out what we were supposed to be doing with each other. Now the connections seem much more clear. As scholars begin to understand the importance of open access and digital preservation (thanks, in part, to funding agencies requiring data management plans), it is easier to see the importance of institutional repositories. At the same time, some schools have started to see their IRs as publishing platforms for born digital scholarship including journals. All of those digital collections the library has been building and buying over the years are also playing an important role in the evolution of digital humanities. In addition to using digitized items as surrogates for their analog originals, scholars are also reusing and remixing those items in curated online exhibits built with Omeka (for example). Those collections are also potentially useful for scholars interested in what used to be – and may once again – be called Humanities Computing. With roots in such fields as computational linguistics and cliometrics, humanities computing uses a variety of techniques to look for patterns in texts. Some of these techniques, like word counts or frequency measurements, are extremely simple but very helpful for some kinds of research. Voyant is a powerful and easy-to-use tool for scholars interested in quantitative textual analysis. More sophisticated techniques such as topic modeling and network analytics come from the world of big data and require both greater comfort with technology and more nuanced understanding of statistics. Scholars who want to do this kind of research may look to the library for the data they want to analyze. While it is still uncommon for vendors of digital collections to provide data in formats appropriate for data analysis, we need to begin asking for it. We can also make our own digital collections available in useful ways. What can UNC libraries do to support Digital Humanities work? People all over the UNC campus are already doing this kind of work and UNC libraries are already supporting them. The new Digital Research Services and the planned Research Hub here is Davis are charged with finding ways to coordinate some of this work to make sure we are not duplicating effort or missing out on opportunities to scale up services. We also hope to be able to coordinate some outreach efforts to make sure the campus knows what we can do for them and to add to the kind of instructional work we already do. I hope that all of this effort will result in our faculty and students doing work they would have otherwise been unable to do. Perhaps more importantly, I hope we are able to help people do the work they would have done anyway but in a much better way than they would have done without us. In fact, I think that librarians are uniquely positioned to sort out some of the hardest questions digital humanities has raised. How should digital humanities projects be designed and developed? Which ones need to become part of the scholarly record? How will they be discovered and accessed by other scholars? How can they be maintained and preserved? Libraries do not necessarily have definitive answers to each of these questions but we are used to working on them and we probably have opinions already. By getting involved with these projects at the beginning rather than at the end, we can help our scholars make better decisions and create more valuable scholarship. A couple of days ago I posted a Project Charter template we used to use in the Digital Scholarship Commons at Emory. A charter is a relatively light weight document we used to facilitate the planning process and to help out when team members couldn’t quite remember what the original plan was. In DiSC, the project charter would come into being after a project had been approved for development. In order to get that approval, hopeful partners would need to submit Project Proposal. We created and iteratively modified this template in the hopes of getting consistently clear and workable proposals. This is a slightly more detailed document that requires some relatively heavy lifting. At Emory, we actually required strongly encouraged folks to consult with the Office of Scholarly Communications, the Digitization Lab, the Director of Software Development and/or a metadata specialist whenever applicable to their project. I’m sharing it below in case any one is interested. I also want thank my collaborators Brian Croxall, Miriam Posner and Roger Whitson for their work on the template. I should note that this form will be over-kill for many projects. At DiSC, this form was used for projects that would receive funding and months of committed development work. I encourage everyone to read Jennifer Vinopal and Monica McCormick’s excellent article, Supporting Digital Scholarship in Research Libraries: Scalability and Sustainability, for a model of how to think about tiers of service rather than a one size fits all approach. A project proposal process will be vital for large projects but may scare away and/or annoy people with smaller projects. Striking a balance between empowering experimentation and providing sustainable support is tricky for everyone. What scholarly questions does this project address? Are there any intellectual property or copyright concerns with this project? What specific technologies and expertise will be required to develop and maintain this project? What library resources are needed? How will users find/access the project once it is complete? Will new content need to be added to this project after two years? If so, who will add this content? Will the project remain on Emory’s servers (if applicable), or will it be hosted privately or at another institution? Who will maintain the project (e.g., update software) after two years? Since starting my awesome new gig here at the University of North Carolina, the one thing I have been asked to pass around is this template for project charters we used to use when I was at Emory. So, I’m just going to stick it here in case other folks want to check it out. We created this for the old Digital Scholarship Commons (DiSC) and Brian Croxall, Miriam Posner and Roger Whitson each had a hand in drafting it. Basically, it is a deceptively simple set of questions that serves a few purposes. First, it guides you through an important series of conversations about what, exactly, you are doing and when you are doing it. Second, it asks you to think about maintenance and preservation. These issues are totally obvious but are not addressed at the beginning of a project often enough. Having a process that requires you to write a statement about these things forces reminds you to at least have the conversations. Third, having a charter in place gives you something to refer to when partners inevitably remember things differently. This does not mean that the charter should be considered sacred scripture but it will help to remind people when something is a change of plan and provide the opportunity to consider what that will cost in terms of time and effort. Please indicate roles for individuals. Describe the scholarly goal of the project. Please list each discrete part of the project that needs to be complete in order for the project to be called complete. In what order do the parts need to be completed and when will all work be completed? How and when will your project launch and what will be needed to make that happen? Also, who will be responsible for the care and maintenance of the project over the course of its life? Please describe what should happen to the project when it is no longer in production which could happen when the project owner(s) move to a different institution or retire. In my role as the digital scholarship librarian at the University of North Carolina, Chapel Hill, I often feel as though I am mostly DH adjacent. Basically, if a humanist wants to incorporate some technology into a research project, I am there to help. Whether or not the project needs to be called DH is probably another matter and, mostly, I don’t actually care. While I try not to get hung up on labels, I DO care about what kinds of things people are doing, how they are doing those things, what problems they are having and how libraries can help. So I spend a fair amount of time trying to keep up with the ever-expanding range of DH work and I pay particular attention to how it does/could/should intersect with libraries. In doing so, I am guided by my commitment to libraries and my profession as a librarian. For me, this implies a certain stance and certain set of values. It means I think access to information is a social justice issue and I want to see people empowered to use information for the common good. Barbra Fister, librarian at Gustavus Adolphus College, wrote a concise and straight-forward post titled Some Assumptions about Libraries for Inside Higher Ed that to which I often return for inspiration. It’s worth reading the whole post but I want to focus on is her point about not wanting libraries to let “productivity” become the way we define success. This is crucial to reminder as we think about partnering on digital projects. DH is famously interested in building and will occasionally proclaim “less yack, more hack.” Furthermore, libraries often get involved in DH projects specifically for their production capabilities. While I don’t think Fister is suggesting that any of this is wrong, she reminds us that building and hacking are never the whole story. For one thing, hacking is often experimental and playful rather than rigidly productive. Even when we do get down to the business of building, this is only one part of a much larger process that involves developing community, exploratory learning and critical reflection. Facilitating, even encouraging, all of this and giving scholars the physical and mental space to work is how libraries collaborate and it’s what makes us partners and not just customer services providers. 1. Scholars like Stanford’s Franco Morretti and the University of Richmond’s Ed Ayers are doing groundbreaking work in the humanities using data/text analysis. You can read about Morretti’s practice of “distant reading” (as opposed to close reading) in THIS times article. You can read about Ed Ayers’ Visualizing Emancipation project HERE. Really smart people getting recognition for this kind of work will lead to both greater acceptance in the academy generally (think tenure and promotion) and greater interest from individual scholars. 2. Knowledge of how to use the tools needed to perform text/data analysis is becoming more common. Part of this is that there are more opportunities for training from online courses. More importantly, some of the tools are becoming much easier to use. Google N-Gram viewer (discussed below) is a really simple word count tool but other more sophisticated tools have also emerged that require little or no advanced technical training. Voyant Tools, developed by Canadian literary scholars including Stéfan Sinclair and Geoffrey Rockwell offers numerous ways to visualize texts including word clouds, word frequencies and network graphing. Newer tools such as RAW perform similar functions. 3. The machine readable data sets scholars need to conduct this research are beginning to become more prevalent. Approaches like distant reading depend on statistics and averages so the patterns you detect are more useful the more representative (and large) your data set is. Google has been allowing users to conduct relatively crude text analysis through the Google Books N- Gram viewer. (Read more about what they problematically call Culturnomics HERE). More recently, Twitter announced plans to open up their archive of tweets to a handful of lucky researchers in the form of DATA GRANTS. Say what you will about Twitter but this archive offers some tantalizing possibilities for researching the fine grain of daily life. This is particularly interesting when you are looking at daily life during extraordinary times. While I Emory, some graduate students I worked with used an archive of Tweets from the Occupy Wall Street protests and they were able to link protest actions with weather conditions and trace the evolution of the movement day-to-day. You can see that project HERE. The webinar on Wednesday featured three speakers though, due to audio problems, I missed most of what the last person was saying. CRL captured the audio and the slides and should be making them available shortly. In the meantime, I wanted to share a couple of things that struck me from the first two speakers. The first presenter was Bob Scott from Columbia. I was particularly struck by his description of the library as a workshop where scholars can manipulate data. He argued that the library is particularly well suited to this role because they have access to the data, are centrally located and, importantly, can keep an eye out for ways to reuse, remix and recycle tools and data sets. Scott suggested that libraries could do more to work with vendors to make more analyzable and text-mineable data available. He suggested that we could argue for APIs, vendor “sandboxes” or even just files in cloud based storage. Some libraries already have data sets they may not know about in the form of back-up drives sent from vendors of online databases. Duke has experimented with making these drives available for data analysis. 2) Allow librarians to begin experimenting with data sets and tools as a way to build skills and identify needs. Scott also pointed out the problems associate with this including the need for new skills, new partnerships and even new positions despite the absence of any new time or new money. The second speaker was Kalev Keetaru from Georgetown. He is the author of Data Mining Methods for the Content Analysis (UNC Library // Amazon). This talk focused a bit more on working directly with vendors to provide usable data for scholars. In his experience, vendors are sometimes willing to work with libraries and scholars on a case by case basis. However, doing this can be very time-consuming so they want to make sure the researcher know what he or she is doing. I doubt that “case by case” will be the way that vendors want to deal with this for much longer as text/data analysis becomes more and more common. Libraries and librarians can really play a crucial role here by communicating the needs of researchers to vendors and demonstrating the value of these techniques to scholars. Between 1990 when the International Olympic Committee announced it had selected Atlanta as the site of the Centennial Games and the summer of 1996 when the Games actually took place, Atlanta witnessed dramatic and sometimes frustrating changes. Though the entire metropolitan area was affected by the games, the focal point of the activity was the so-called “Olympic Ring” which was the name given to the three-mile radius which spread out from the center of Downtown. This is a particularly interesting fact because the 1996 Games were remarkably centralized despite the fact that Atlanta itself was, and remains, famously de-centralized. This was by no means an accident and represented a major victory for downtown’s business and political elite. While the city and its residents no doubt enjoyed the honor of having been selected for the Games and were understandably excited the chance to show themselves off for an international audience, there were some very practical concerns which led to the decision to pursue the Games in the first place. First, the games represented a golden opportunity to the political and business elite who had sought for years to attract this kind of attention to the downtown area. Furthermore, and more concretely, a study commissioned by ACOG from the Selig Center, an economic think-tank and the University of Georgia, estimated that the games direct spending by ACOG would generate $1.1 billion in earnings for the state while visitor spending would generate an additional $814 million. Furthermore, the same study predicted the games would add 77,000 jobs to the state across a variety of industries (Humphreys and Plummer 1995). ACOG promised state and local politicians that the costs of preparing for the games – including administration, promotion and construction – would be covered by sponsorships and they tried their best to make sure this happened by initially charging $40 million for exclusive sponsorship deals though they later had to drop the price when corporations were unwilling to pay (Rutheiser 1996, 258-259). However, Larry Keating argues, in his book Atlanta: Race Class and Urban Expansion, “a careful analysis of exactly how much money federal, state and local governments actually spent on preparing the city and putting on the games reveals that the cost to taxpayers exceeded Olympic-generated government revenue by a wide margin” (Keating 2001, 143). According to Keating’s calculations, which took into account thirty discreet public funding sources and fourteen categories of expenditure, the total public cost of the Games reached over $1.05 billion (Keating 2001, 148). Exactly how to understand this figure is tricky because it must be measured against the revenue that has resulted from the increased publicity and international prestige the games brought to the city and this figure is almost impossible to honestly calculate. While the debate over the actual financial bottom line of the games will most likely continue as long as anyone cares to take it up, an equally contentious debate continues in tandem with it over the effects the Games had on the social geography of the city. Of particular concern are the effects the Games had on Downtown residents in Summerhill which is the neighborhood nearest the Olympic Stadium. Furthermore, the communities at Techwood and Clark Howell Homes; two public housing projects just west of the central business district and right in the middle of the “Olympic Ring” were not only changed but totally removed. Each of these areas were sites of massive construction projects related to the Games and, in Keating’s assessment, one of the lasting impressions of the Games was the “arrogant disregard displayed by ACOG for those adversely affected by the facilities it built” (Keating 2001, 143). The neighborhood of Summerhill is south, and slightly east of Downtown. Historically a working class neighborhood, it has perhaps suffered the most from Atlanta’s growth over the years. In the 1960s, blocks of structures were demolished in Summerhill to make way for, first Fulton County Stadium and, a few years later, the construction of Interstate 20. In the 1980s, Interstate 75/85 – the so-called “Downtown Connector” – was directed away from Downtown and right through the middle of Summerhill. In preparation for the Olympics, Summerhill was once again selected as the home of a new stadium, the Olympic Stadium, which would later become Turner Field and home of the Braves after the older stadium was demolished. Neighborhood residents formed an advocacy group called Atlanta Neighborhoods United for Fairness (ANUFF) to organize against the stadium’s construction. They argued that more construction and more traffic would further disrupt their community. However, the Atlanta Journal-Constitution “accused ANUFF of NIMBYism [Not In My Back Yard] and lack of public spirit” (Burbank, Andranovich, and Heying 2001, 104). This seems particularly callous given that the neighborhood had sacrificed so much for the city’s development over the previous three decades. In addition to being attacked by the media, Keating reports that the partnership that had formed between ACOG and the Braves concerning the construction of the new stadium “would not allow representatives from the neighborhoods adjacent to the stadium to participate in their planning sessions and the plan they came up with did very little to limit the damaging effect of the stadium on these low-income black neighborhoods” (Keating 2001, 144). Having been relegated to the role of junior partner in the Olympic planning process, the city could do very little to help the people of Summerhill. Ultimately, the stadium was built at the cost of several blocks of homes and commercial structures in at least three neighborhoods. At the time, Summerhill could claim a small victory in that they were able to secure a pledge of $450,000 for neighborhood redevelopment and job training programs. Furthermore, Greenlea Commons, a townhome development in Summerhill, was constructed for the games and the units were rented to Olympic officials – at a cost of $20,000 each for the duration of the games – which allowed the homes to be sold at affordable rates after the games were over. Burbank et al. posit that “Greenlea Commons became an anchor for neighborhood revitalization” (Burbank, Andranovich, and Heying 2001, 105). However, in Atlanta, neighborhood revitalization generally means higher prices and resident displacement as well as the disruption of longstanding social networks. In this sense, the authors are absolutely correct. Summer Olympics.” Selig Center for Economic Growth. 1995.
http://www.terry.uga.edu/selig/olympics [accessed September 24, 2009]. Rutheiser, Charles. Imagineering Atlanta: The Politics of Place in the City of Dreams. I want to begin with a potentially disappointing disclaimer; while the title of this talk is Digital Humanities or Just Humanities I’m not actually going to answer that question. Rather, I want to use the existence of the question as a jumping off point to talk about what this whole thing looks like from my perspective as a digital scholarship librarian. If that sounds like I’m sidestepping something, it’s because I am. I’m uncomfortable with the binary – this or that – and I detect a bit of defensiveness in the very asking of the question; an attempt to re-inscribe emerging and challenging ideas into a safe and familiar field. The question seems to ask for some reassurance that everything will be OK and that the computers won’t really change what we think of as the humanities. There are many appropriate and necessary critical responses to what might broadly be thought of as “the digital” but dismissing it as a trend or trying to rhetorically neutralize it is a wasted opportunity. There is no need to retell the genesis story of the name Digital Humanities but it is worth remembering that the term emerged to describe a relatively focused field that utilized computers for organizing, displaying and searching for patterns within digitized texts. Over the past 4 or 5 years, the term Digital Humanities has expanded beyond its birthplace and is currently at the point where it is routinely deployed with varying levels of precision and responsibility. It may have become embarrassingly trendy for a little while as well. I do not have to tell this group that this happens all the time; words acquire new meanings and fields of inquiry evolve. I don’t want to argue for the purity of any one single definition but, for the sake of clarity, I do want to create a few categories within what is becoming the increasingly stuffed bag of DH. This expansion of what counts as digital humanities has changed the way some scholars think of what counts as their work and the concept of building has emerged to differentiate some work from a more contemplative and traditionally discursive humanities. I don’t want to make too much of this distinction though; while we can obviously think of traditional humanities writing and lecturing in terms of building, digital tools allow us to really extend that in deeply engaging ways to include dynamic, multi-modal projects. My fellow panelists will cover classroom-based building but we can also point to the emergence of digital methods and widespread adoption of digital tools in humanities research. I’m thinking of the building of digital corpora, databases and visualization exhibits as well as the codes, scripts and algorithms that help us create and analyze them. Graduate student training, particularly methods training, has been expanded to include hands-on work building projects collaboratively. Likewise, digital publishing has given us the ability to build dynamic and interactive content into scholarly essays, articles and books. I first became aware of this particular thread of the conversation, this emphasis on building, when I attended my first THATCamp. The Humanities and Technology Camp is an unconference. That means that sessions are proposed, selected and scheduled by the attendees more or less on site. There are no presentations or PowerPoints and the focus is on skill sharing and collaborative creation. Something you are likely to hear at THATCamp is “less yack, more hack.” The unofficial slogan playfully and explicitly draws a distinction between THATCamp and more traditional gatherings. If a traditional conference, such as this one, is focused on individual scholars reporting on the conclusions of their research, THATCamp seeks to start projects, build communities and provide hands-on training for tools. a more haptic humanities is almost necessarily more collaborative. Of course, what I see as the benefits of building, others may see as the drawbacks. Building requires learning new skills. Collaboration requires time and, occasionally, compromise. And some of us really like the fact that most people don’t understand what we do. We’d never say that of course but I think it’s pretty obvious. Other concerns came to the fore in early 2011 after Steve Ramsay, speaking at MLA, stated explicitly that digital humanities is about building and suggested that digital humanists needed to know how to code. As “digital humanities” had popped up in a number of job ads and appeared to have caught the attention of numerous funding agencies, Ramsay’s remarks provoked some anxiety amongst an already anxious group. Furthermore, some thought the comment was elitist and created an exclusive in-group. This was puzzling, of course, for all the DH scholars who had been toiling away in relatively low prestige quarters of the academy for years and had built a radically egalitarian scholarly network committed to open access and freely available open source software. In hindsight, the ensuing conversation was great. Some really important issues were placed on the table particularly around race and gender and who gets to participate in the digital humanities. For example, how could it be that men would routinely outnumber women at DH gatherings? This is common in the tech industry but not in the humanities. Along the same lines, why were these gatherings usually predominantly white? The community had to ask itself – and needs to continue asking itself – if there is anything structural causing this and if there is anything proactive they could do to stop it. I also appreciated the conversation around whether or not the use of digital tools has always been adequately theorized. Are we sure we are not mistaking superficially dazzling for truly insightful? Is it our role as scholars to confront the sometimes shocking labor practices and dangerous environmental impact of the tech sector that fuels our work but is completely hidden from us and allowed to remain hidden by us? what I am advocating for is a more central role in DH for this skeptical digital work, both embedded in and existing outside of the digital projects and tools we use and build. There is clearly still work to do on this front and I hope that kind of critical embrace characterizes the next chapter of this story. Ultimately, and to get back to the question I sidestepped at the beginning, I don’t think it really matters if you want to say digital humanities or something else. What will matter is whether or not you are doing good work, ethical work and work that makes effective and rigorous use of the tools and methods that are available whether they be digital or not. I don’t recommend adding digital tools just because you think its cool but I absolutely advocate taking some time to experiment to see if something might be useful. At the Spring CNI meeting in April Jay Varner and I presented the work we have been doing in the Digital Scholarship Commons Emory Center for Digital Scholarship using Amazon cloud hosting for all of our projects. Jay is the Digital Scholarship Solutions Analyst in the Library and has several years of experience using EC2 and it seemed like a good solution for our hosting needs. He is also my brother. CNI recorded the talk and the slides so you can watch the presentation HERE. Watching someone else’s PowerPoint slides is rarely entertaining but there aren’t that many and one may or may not be a picture of me and Jay when we were really young. The webinar was the result of a conversation that started at the national EDUCAUSE meeting last November in Denver. I want to thank Nikki Reynolds, Director of Instructional Technology Support Services at Hamilton College for organizing everything and keeping us on track. In case you missed it, I wanted to set out what I talked about. The format for the webinar was something like a lightning round where everyone had 5 minutes to talk. What is below reflects more or less what I said so its pretty short. If you have any questions, let me know. Chances are you will not be starting completely from scratch. In fact, you may find that the library and central IT are both offering similar services (website hosting, data storage). Furthermore, you probably already have some of the hardware and software on hand. Do a survey and get get everything that already exists on the table. Next survey what expertise you already have. Do you have database designers who could also partner with literature scholars? Also remember that willingness to build on existing skills is extremely valuable. Finding additional training for someone you already have on staff is almost always preferable/cheaper than trying to hire the skills you think you need. Once you figure out what you have, see if there is anything you are missing. Look around to your peer institutions, ask questions, and make a list of resources and capabilities you might want to add as you are able. Early in the process (probably at the same time you are taking stock of your assets), hit the pavement and start finding out what people need from you. Get in front of admins, faculty and students any way you can and say that you want to help them do their work. Go to department meetings and prospectus defenses. Check to see if there is a humanities council or center on campus. Administrators know that digital is the future but they need help understanding what concrete steps can be taken to help the widest number of scholars. They need to know how this support will scale to the whole campus. Faculty respond well to impressive work their peers are doing and enjoy the opportunity to meet those scholars. It is best to avoid a “field of dreams” fallacy (if you build it, they will come). That being said, you know a few things. One of those is that some folks are going to want to build simple websites. Decide what CMS you can support (I suggest WordPress), where it will live, who will maintain it and what agreements need to be in place for sustaining a website through its entire life cycle. I said that all in one sentence but none of that is particularly easy when you are dealing with a (most likely) underfunded, large, technical bureaucracy that values security and permanence above all else. Get started ASAP. Some Digital Humanists are fond of saying “less yack, more hack” because they really enjoy building. This is a fine value to embrace but there does need to be some yack at the beginning of any project. A: Create a project charter early on. This document will be outline the scope of a projects and define the rights and responsibilities of team members. The IT side of the house might think of these as “Service Level Agreements” and that is fine but we have found that humanists may have an aversion to management speak. B: Try to adopt reusable tools. You do not want to get in the habit of starting every project from scratch. Conventional wisdom is to find free, open-source tools with large user communities. To help with this search, I recommend PROJECT BAMBOO DiRT. C: Consider access and sustainability at the beginning of a project. How are people going to find your project once it is built? Can users with disabilities use the it? How will you take care of it once it launches? What about after it “sunsets”? These are all important and relatively complicated questions and they are made almost impossible if you wait to ask them after you finish building. Save yourself time and build responsibly. Be honest with yourself and your partners about your capacity. It’s not fun to tell someone no but it is worse to tell them yes and then not be able to follow through. However, don’t feel like you will never do something just because you can’t do it now. If something is really worth doing, start figuring out what it would take to make it happen. Partner with the disappointed would-be partner to start making the case for getting the resources. Knock on doors, submit proposals and apply for grants together. When I first saw that Henry Rollins was going to be a keynote speaker at this year’s ACRL meeting in Indianapolis I was even happier that I was going to be there. A couple of years ago I might have been surprised to find this punk rock icon at a library conference but now I think this makes perfect sense. There are punks all over library-land. This is probably not a coincidence. I can only speak for myself but it is not the case that I grew out of punk and became a librarian; as far as I’m concerned, its the same identity. Just like with punk, I do this because I love it and I think its important. Also, despite the stereotype of the shushing librarian in sensible shoes, there is something anti-authoritarian and even confrontational about being a librarian. Librarians fight censorship and celebrate banned books. We fight for access to information as a human right. Our archivists organize the public record and keep sunlight shining on our civic processes. We opposed the Patriot Act when others were silent and we look at Google and say, we’re still better. Furthermore, a library is a fun, exciting and supportive and community. To be honest with you, I never really cared for most punk music and I was always dismissive of thinking of punk as simply fashion or lifestyle. The people, however, are amazing and inspiring and it is largely due to the punk community that I think I turned out to be thoughtful, open-minded and conscientious. 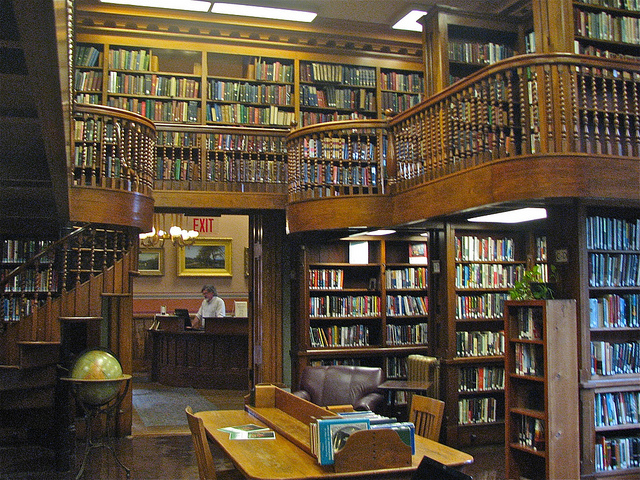 Similarly, it was the rad people I met in the library that made me seriously want to work in one. Librarianship is an entire profession built on helping and sharing; of course it’s a place that attracts great people. There is one thing I learned from punk that I would like to see a little more of in libraries and that is an embrace of DIY (Do It Yourself) as an ethos. There is actually already quite a lot of this particularly coming from library school students. I’m thinking, obviously, about In the Library With a Lead Pipe, Hack Library School, the Library as Incubator Project and LibPunk. So my concern is not actually that librarians are not interested in doing this but that there may be structural issues that are blocking them. Librarians are already taking the initiative to start projects and build communities but too often it feels like these are extra-curricular. What if librarians were as empowered as their patrons are by the library? Some institutions are already taking advantage of the amazing energy and talent they have on staff but it remains untapped at others. That being said, one thing that I like about libraries that always bugged me about punk is that, well, not everyone at the library is a punk. It is often pointed out that, for a bunch of people committed to individuality, punk can be a little (or very) homogeneous. One of libraryland’s real strengths is its ability to have a common purpose while fostering and celebrating diversity. Punks could stand to learn a thing or two about this at the library. Watching Rollins give his presentation was amazing. I wondered what angle he would take and I shouldn’t be surprised that he took all of them. The Twitter back channel contained several comments indicating that he was actually a librarian for his efforts to preserve the material culture of punk. I agree with this but I would also flip it; librarians are punks.